If there were 6,000 reasons I felt lucky to be a San Francsican, here’s reason #6,001: Bike camping in San Francisco is wildly easy. I want to take a few small tours to test out my load and my gear before I ship off to France. In fact, this probably could have happened sooner. A mini-adventure is always a great reality check. The best advice I can offer to hikers, cyclists, climbers, and adventure-seekers of any sort who are shopping and researching is to just go. Plan a short trip with what you have on hand and just get out there. Everyone is adamant about their advice and everyone’s advice is different. You won’t know what is important to you until you’re setting up camp. 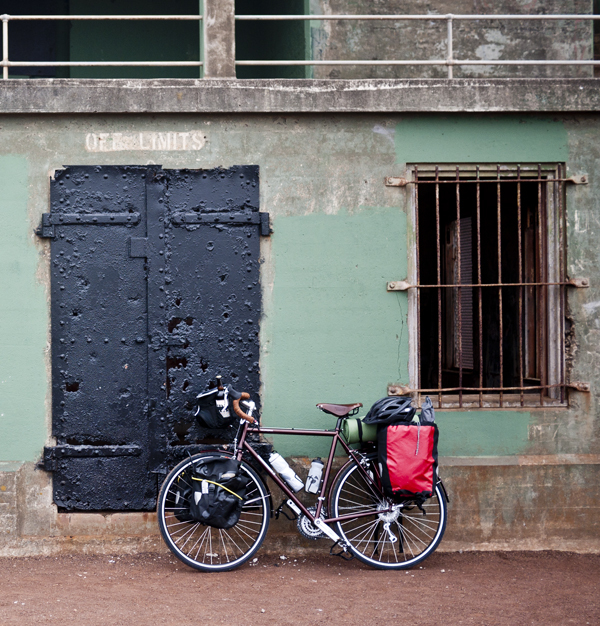 With that in mind, I set off for the Marin Headlands from San Francisco on what my buddy E. referred to as a “simulation.” I packed more like I will for the actual bike tour than how I would have packed for a night in the Headlands, because I wanted to feel the actual weight of my bike. I reserved a bike camping spot at Bicentennial Camp. This required that I stop by the visitor center for a permit. The visitor’s center closes at 4:30. But my buddy and I had to finish discussing Breaking Bad and eat some falafel. We got out of the city late and in no time to actually visit the visitor’s center. Not having a permit was absolutely no issue. I felt a little extra prepared with my new handlebar bag. Before I left, I stopped into Sports Basement in San Francisco. They claimed to be out of handlebar bags. Then, walking out disappointed, I noticed a really nice bag on a display bike in the middle of the sales floor. A helpful staff member was nice enough to remove it from the bike and sell it to me. Score. It’s a great little bag for your camera, map, and a little food. Getting to Bicentennial Camp from San Francisco is easy. Take the Golden Gate Bridge, find the one-way tunnel and basically proceed straight. When there’s a sign for the Visitor’s Center, it will be helpfully pointed away from you. Luckily, you can learn a lot by looking at the backs of signs. We found our camp site after a few photo-touring adventures of batteries, cliffsides, and a light house. I set up my tent in a spot that would have been a lot nicer to set up a hammock. This was my final indication that it would be smarter to tour with a hammock. This is one of those debates where everyone’s opinion is different and equally strong. I really like camping with hammocks. I spent some time on the Appalachian Trail and carried only a hammock. I think they’re light, easy to set up, and I sleep well in them. If you like spending time in your tent or can’t sleep well in a hammock, they’re a bad idea. For me, they’re just a great way to save weight. E. and I found a small beach that was dark and rocky. We spent some time staring into the thick gray fog of the bay and then built a really impressive cairn. If you don’t believe me that it was impressive, you’re welcome to go find it. Find out more about bike camping in San Francisco here!